There are so many long weekends in 2019 that the traveler in you will love. If you have difficulty taking leaves, you can still make 2019 a year of travel, by planning your holidays around the long weekends. This way you can keep the spirit of traveling and exploration alive. In case you do not wish to travel you can always use these holidays to spend a gala time with your family. 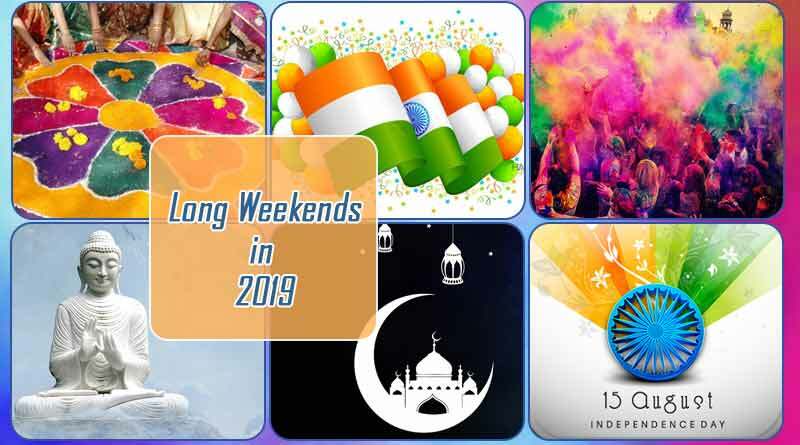 Here is a list of long weekends in 2019, which will help you to plan your holidays in advance. You can celebrate a wishful long weekend in the month of January. Dates of festivals of Lohri, Makar Sankranti and Pongal are marked as per the Hindu astronomical charts. You can enjoy with your family and can visit places to witness the festivities during this time. Use this time to either travel or spend a cozy family time indoors. If you are in New Delhi, or at one of those places where the Republic Day is celebrated with great valour and spirit of patriotism, then you can also use this holiday to witness the Republic Day parade and other shows meant for the day. This year Holi will be celebrated from the evening of 20th March and will end on 21st March. You can take leave on 22nd March (Friday) so that you can enjoy a long weekend. On this occasion make time for family and friends. This is especially important for those who don’t spend much time with their loved ones during the week. This year Mahavir Jayanti will fall on 17th April and Good Friday will fall on 19th April. It will be better if you take leave on 18th April 2019 (Thursday) so that you can get five days to relax. April month is perfect for a trip or vacation. Spend some super long weekends with your family, friends in April. Eid and World Environment Day will be celebrated on 5th of June this year. If you are planning to go for some trip or to chill in the month of June, then it is best if you take leaves on 3rd (Monday) and 4th (Tuesday) June. You will get five days to enjoy and spent much time with your family. In the month of August, there are many holidays. Bakra- Eid will be celebrated on 12th August 2019. 15th August is celebrated as Independence Day. You can smoothly go for two consecutive long weekends like that. Janmashtami will be celebrated on 24th August (Saturday) this year. The freedom to travel should really be evident in August, for there is a good lineup of holidays in this month. Some more brainwork can lend you a mammoth weekend. 10th September will be celebrated as Muharram and 11th September as Onam. One sneak leave on September 9 (Monday), and you have so many days in hand that a good break by the beach does not feel far away. September brings more chances for a trip given the pleasant weather. On 8th of October is the festival of “Dussehra”. You can make most of this festival by taking an off on October 9th (Monday) and here you go with four leaves in hand inclusive of the last week’s Saturday and Sunday. Days: Friday, Saturday, Sunday, Monday and Tuesday. On 25th October (Friday) is Dhanteras, on 27th October is Diwali, 28th October will be celebrated as Govardhan Pooja and on 29th lies Bhai Dooj. October is the month of festivals. It brings Diwali and a whole lot of holidays with it. A good look at the long weekend calendar for the year reveals that you can have a grand celebration this time, with an international vacation thrown in for good. On November 12 (Tuesday) there is Guru Nanak Jayanti. An off on November 11 (Monday), can give you a splendid four days off. November is a good time to explore the places as the temperature falls down and the weather is just perfect to move out. With the Christmas Day falling in between the week can give you options to club it either with the previous or coming weekend to get an elongated weekend.